The Japanese venture H2L (Office: Chiyoda District Tokyo, CEO: Ken Iwasaki) has began the sales of “UnlimitedHand”, the Haptic Game Controller that allows a wearer to intuitively control and feel haptic feedback within Virtual Reality games. UnlimitedHand is now available for purchase on Amazon’s retail sites, UnlimitedHand’s official web store and retail stores in Japan. Last year, on September 22nd, UnlimitedHand’s Kickstarter campaign was announced when H2L premiered at the Techcrunch SF conference. The campaign managed to reach its goal in just under 22 hours. Up till now, the UnlimitedHand has been distributed exclusively to Kickstarter Backers in the form of a “Reward”. A motion sensor and an array of muscle movement sensors*1 are embedded into the UnlimitedHand. These components allow the wearer to input Hand and Finger movements into virtual environments. 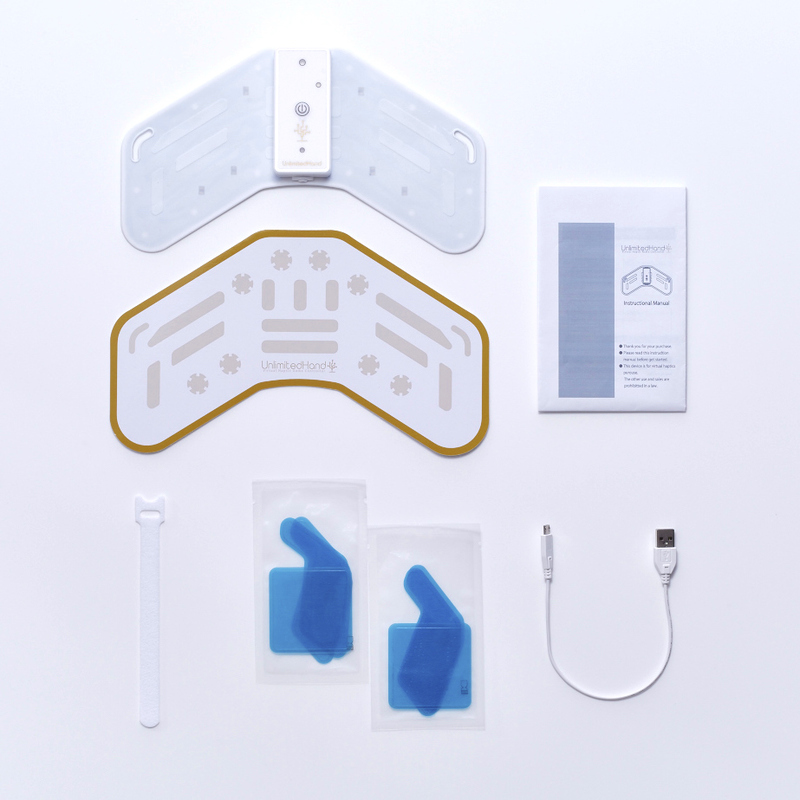 In addition, a multi-channel Electric Muscle Stimulation device*2 is built in to the device. This component contracts the muscles on the wearer’s forearm to simulate haptic feedback. Through integrating these technologies, players of VR games will be able to feel interact with objects or characters inside a game and feel physical impact coming from them in return. Until now, hand held and button based game devices have been the main choice of controllers. However, when we develop for the medium of Virtual or Augmented Reality games, they may break the immersion that we value. UnlimitedHand confronts this by incorporating our hands into the gaming experience. It does this by linking movements of the hand with its virtual counterpart while returning haptic feedback whenever the game deems it necessary. With the UnlimitedHand, one will be able to experience the ricochet from a gunshot, or to pet on characters with their very own hands. A technology that monitors the positioning of muscles on the forearm to deduce finger movements. A technology that passes electrical stimulus through tissue and muscles on arms or legs to generate movement.